When Exeter was famed for the woollen trade, the processed serge was hung out to dry on racks with 'tenter hooks' in areas reserved for drying. This street is in the West Quarter, off Preston Street, was one such area. 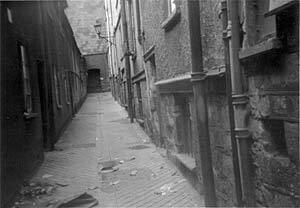 In the 12th century, the street was known as Tyght Street, which may be derived from the word narrow. It was referred to as Racke Lane in 1562. The only pub listed in Rack Street was the Prince Albert, which was listed between 1850 and 1894. It was in 1844 that ragged schools were first founded in London to 'elevate the condition of the poor and ignored children'. Exeter introduced its first ragged school in 1846 in Rack Street, for 25 boys and 25 girls. By 1860, the school only catered for girls, as the boys went to Mary Arches Street. White's Directory of 1878 suggests the school was still running. In 1859, John DInham conveyed property in Rack Street, formerly used by the Devon and Exeter Central Schools for use as Rack Street Infant School, which for some reason acquired the no doubt ironic nickname, Rack Street Naval College. Many of the children who attended, would start their day with a Farthing Breakfast at the Coombe Street Mission before walking to school. Rackfield Place, along with North Street and the slums of St Mary Major were noted in the early part of the 19th century for their brothels, and the problems they caused for the police. "At the bottom of Rack Street there was a lodging house, under the name of Atkins and for 4d a night they could have a bed. I was very friendly with the eldest son because his birthday was 4 days prior to mine and I used to go and celebrate his birthday and he used to come up my house for mine. One of the characters there went under the name of Cast Iron Jack because he made a trolly out of old bits and pieces and he used to go to the local tips and pick up bits of scrap metal. Another character in the house was a man called Chuck 'em over Board, simply because he wore a seaman's cap. But he was commonly known as Jack by the people who knew him. The Atkins made him a trusty and he was in charge of all the other tramps to make sure they didn't come in drunk and kept their times." Rackclose Lane once ran between the upper leat and the city wall from the Quay, behind the Custom House to just below the Snail Tower. 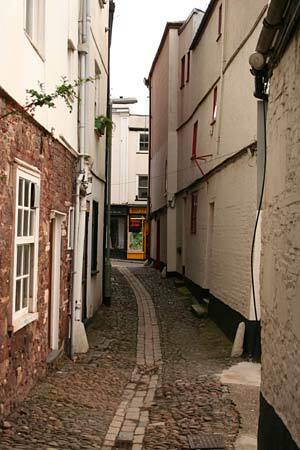 The surviving named Rackclose Lane shows what many parts of Exeter looked like before the Second War - situated parallel with Bartholomew Street and the city wall, it retains its cobbled surface. Before New Bridge Street was built, the lane continued below Allhallows on the Wall, which was built at the end of Fore Street, parallel to West Street to Edmund Street. The eastern end of the lane from Edmund Street to the Quay was renamed Cricklepit Lane in 1868, as memories of the rackfields faded. The inn known as the Hole in the Wall was referred to in the Protestant Mercury during 1723 when it was stated to be a dwelling house in Rack Lane; this was may have been Rack Street or Rackclose Lane. Thomas Shapter in his book on the 1832 Exeter cholera outbreak wrote of an illustration by John Gendall of Rackclose Lane "this is a very characteristic sketch of what prevailed in 1832. The town walls in the lower part of the city were much built upon and against, for the houses seen upon their summit have one or two stories beneath on the inner side..." The illustration showed the narrow street with houses piled upon the wall on one side and houses opposite, blocking out the light. There are pigs wallowing in the filth. It was the overcrowding which saw the West Quarter have such a high death rate in the outbreak of the disease. Along the middle section of the old Rackclose Lane that still exists beneath the city wall by the West Gate, there can be seen medieval stonework with putlog holes, which were used for wooden scaffolding when repairing the walls. A conveyance of eight freehold dwellings in November 1932, refers to "Water Lane formerly known as Rack Close Lane." This is the only reference I have seen, and the lane is still known as Rackclose Lane. Source: Various sources including Exeter City Wall by the Devon Archaeological Society and records in the DRO. Rackclose Lane 1962. The houses on the right backed onto the city wall, the house on the left were Beedles Terrace. Rackclose Lane looking towards New Bridge Street.